This is one of my favourite photographs I took during the outdoor wedding ceremony at Kortright Centre, a beautiful conservation area located north of the Greater Toronto Area. This image was captured during the ceremony, while the bride was walking down the line, accompanied by her mother and father. Traditionally, the father of the bride walks or don't the aisle and is placed on her right. This tradition dates from the medieval times when, during the arranged marriages it was common for enemies to attack. The farther of the bride was walking on her right to have immediate access to his sword. Nowadays things have changed but it is still customary for the bride's father to accompany her down the aisle walking on her right. This photograph has three converging stories. In the foreground, we can see the groom looking at his bride. He's in the bottom right of the frame and is importance is given by the fact he is the largest subject in this image. In the middle ground, we can see their guests churned towards the bride who is walking from the background down the aisle. The aisle has created a oblique line in the image uniting the bride and the groom. 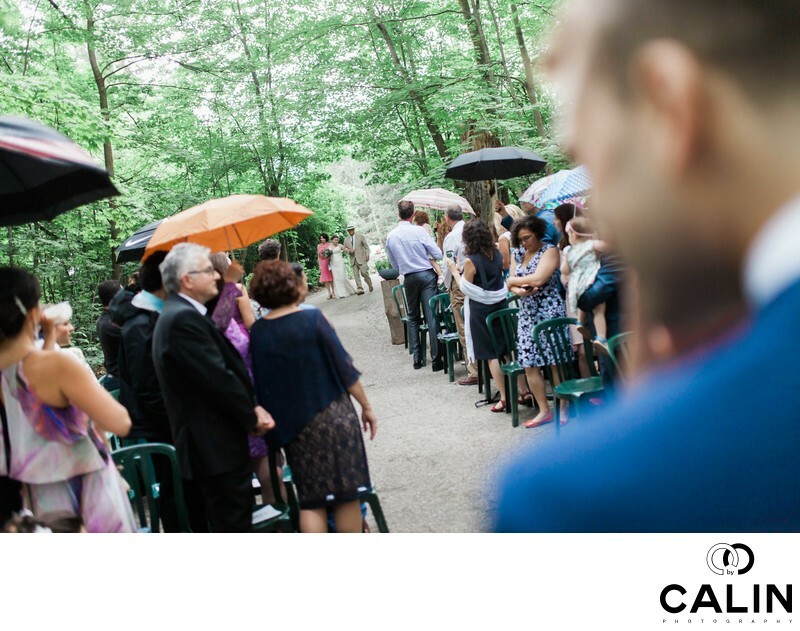 This subtle element of composition conveys the link between the two people tying the knot at Kortright Centre and gives the image a more dynamic nature. The viewer enters the frame through the top left, then meets the bride and her parents. As the bride is looking towards the groom, as you were is invited to follow her gaze towards the secondary subject in this image: the groom. As the focus is placed on the bride, that renders him out of focus so the viewer has to return to the top left of the frame in an infinite loop that creates excitement and makes this image outstanding. I took this image using a Fuji XT2 camera and a 23 mm 1.4 lens. To have the beautiful bride, the guests and the groom visible, I shot this image at F11. Because the couple wants to have an outdoor wedding ceremony in the Cathedral of Trees at Kortright Centre for Conservation, there was sufficient light for me to shoot at such a narrow aperture to create a massive depth of field. That was also the reason why I use the wide angle lens because it gives the photographer more depth of field. In order to refine this beautiful image, I had to work all lot in post-processing. Besides fine-tuning the colours, I also had to use local adjustment brushes to brighten the bride and her parents. Because they were running under the canopy of trees in the raw image, they were dark and almost invisible. However, the best wedding photographers shoot with the final image in mind. We know the possibilities and limits of post-processing software like Photoshop and Lightroom. Also, I darkened the groom so that the exposure is uniform across the frame. Because of the three layers, this wedding photo looks three dimensional and that makes it unique.